We are edging toward our last first... the first anniversary of the day Tony died. The recent snow storm has stirred up lots of memories of that time, but it was just this time of year. Crap weather, being stuck in the house, lots of snow days for the girls... combined with the feeling of this time of year... turning inward, reflection, and rest. I still turn to see his expression when something funny happens, and there's something I desperately want to talk to him about every day. The girls and I talk about him all the time, and often we look at old pictures or videos. But we have developed a new routine... no longer centered around him, and we have many new memories which he didn't help make. As I have started to re-form my life, it is hard to not panic over the unknown. Everything is unknown. I suppose that's always the way it is, but we often comfort ourselves by assuming we know what the future holds... when, of course, we never really do. It gets tiring captaining this ship, and although we have a wonderful support system, I really miss that one guy who was always in my corner, propping me up. I'll spend these winter months learning how to prop myself up... reaching for memories to sustain me... figuring out how to stand a little taller on my own. And I'll look forward to the hope of the spring, new beginnings, new chapter, slightly stronger me. It's so hard to wait and see what the future holds... but we all have to wait for the spring to come again. Last weekend, I took the girls skiing for the first time... well... I did contemplate getting out there with them myself, but it didn't take long to realize that would be sheer lunacy. So, I went skiing, and they went to ski school. We planned the day a few weeks in advance, and really lucked out to be there as the first snow of the season fell. It was so lovely to be back on the slopes again. I think it was probably 10 years ago that we last went. I really cherish those memories with you... before we had kids, and before ALS of course. The girls had fun, and were both keen to show off their skills when I arrived to pick them up. I snuck past the school area a few times, so I had already seen them in action. Cora was her typical, fearless self and I saw her waving over at Louise, who I am sure was less thrilled with the proceedings. 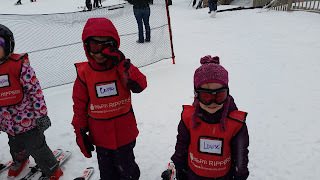 I am very proud of your skiing skills, especially since I taught you! It was certainly the only time in our relationship when I felt more athletic than you... but you learned quickly, so that didn't last. I had a student again this time, and hopefully he will love it as much as you did. When the girls are a little older, we'll all ski together. Skiing and swimming are the most athletic things I'll ever do with them, and I know with your genes they'll be better than me in no time!